If I say “I’m making a 16th century German dress” that means different things to different people. Here are some examples and conventions used on this site. Housebook Dress/Durer Dress – AFAICT this is an unofficial SCA-created name used to describe the style drawn by an anonymous late Gothic painter and engraver who was one of the outstanding early printmakers. He is usually called the Housebook (Hausbuch) Master after a Hausbuch, or sketchbook, drawn by him for the Wolfegg family. The style proliferates in the late 15th century and very very early (first decade) of the 16th century. – Pleats occur across the front of the dress below the end of the V.
– Skirt possibly of one piece with the bodice. – Head dress is usually bare braids on top of the head (or possibly a fake hair piece) or a pleated Wulsthaube. 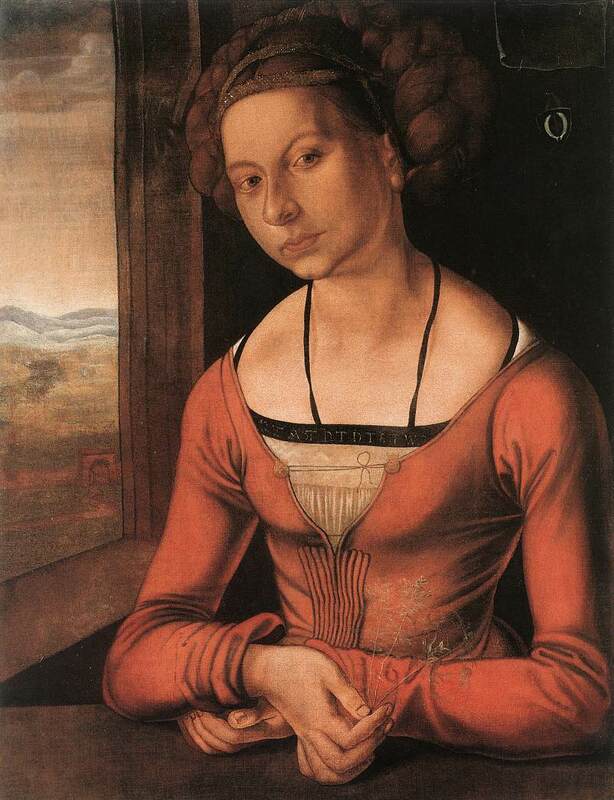 Saxony Dress/Cranach Dress – This style proliferated in the Saxony region of what would be modern day Germany. 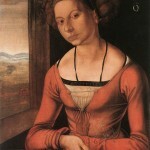 Cranach was a court painter to Frederick the Wise of Saxony. During the time of the portraits under study (1520-1540) he had settled permanently at Wittenberg. Trossfrau/Kampfrau/Swiss Style dress – This style is seen around 1530 in the wood cuts “The German single-leaf woodcut, 1500-1550” by Max Geisberg and in the Triumph of Maximillian. – Closed front opening possibly laced or hook/eye. – Guarding follows the neckline and along the edge of the opening down to the waist. The skirt may also have one or more guards on it. – Guarding can be slashed or patterned. – Skirt pleated into the bodice. – Most sleeves are fairly simple but there may be some slashing at joints(elbow/shoulder). – They could also have wide cuffed ‘funnel’ sleeves. – Headgear is usually a wulsthaube and/or a barret (with and without feathers) of some kind. – the most commonly seen garment on city women of *all* classes. Thanks to Mistress Etaine Pommier and Mistress Erzsébeta Magdaléna for their feedback on this information.